The 14th c. CE Djinguereber Mosque, Timbuktu. -- Photograph 2005 Via Wikimedia Commons. On 24 August, the International Criminal Court (ICC) in The Hague announced the conclusion of its trial against Ahmad Al Faqi Al Mahdi, a radical fundamentalist Islamist charged with directing the demolition of Muslim shrines at the fabled city of Timbuktu in the African nation of Mali. 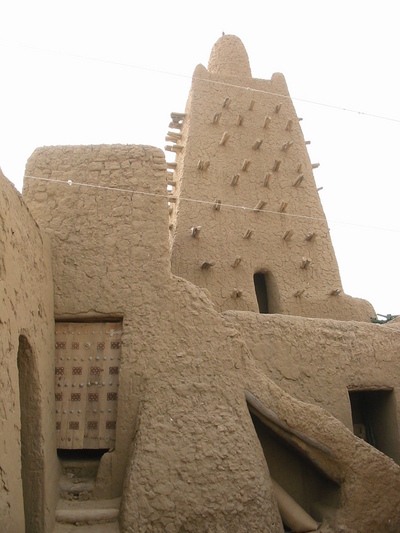 Timbuktu is renowned as a center of Islamic learning, with libraries dating from the 13th to the 17th centuries CE. Alleged to have committed the war crime of "destruction of historic and religious monuments" in June and July 2012, Al Mahdi admitted his guilt in the case when the proceeding began on 22 August. At that time of the cultural devastation, Al Mahdi was head of the so-called "hisbah" or morals militia established in the African city by Ansar Dine (Volunteers of Faith), a violent extremist group aligned with Al-Qaida in the Islamic Maghreb (AQIM). The ICC will pronounce its verdict and issue a sentence, as it judges fit, on 27 September. Al Mahdi is aged about 40 and could receive a punishment of as much as 30 years in prison, according to the BBC. The defendant was turned over to the court last year, by authorities in Mali's eastern neighbor, Niger, as stated in court records. As further reported by the BBC, Al Mahdi's guilty plea was accompanied by an apology in which he declared, "I am really sorry, I am really remorseful, and I regret all the damage that my actions have caused... I would like to give a piece of advice to all Muslims in the world, not to get involved in the same acts I got involved in, because they are not going to lead to any good for humanity." Agence France Presse, as published by the Al-Arabiya news service, disclosed that prosecutors called for a sentence of nine to eleven years for Al Mahdi. AFP pointed out additionally that Al Mahdi had pled guilty to a single accusation, that of "intentionally directing attacks" on nine tombs. The Toronto Globe and Mail described the case as the first dealing with cultural vandalism to be heard by the ICC, the first in which the Court prosecuted an Islamist radical, and the first in which the accused accepted culpability for a crime listed in the docket. The wrecked historic and beloved sacred shrines in Timbuktu were mostly dedicated to Islamic Sufi saints and constructed of dried mud. Al Mahdi was known by the alias "Abu Turab," according to ICC chief prosecutor Fatou Bensouda, and directed the raids on the shrines personally. He was ordered by Ansar Dine to level the shrines, break down a door that was believed destined to stay shut until the end of the world, and to burn manuscripts. The Guardian disclosed on August 21 that of 400,000 manuscripts in Timbuktu, 4,000 were lost, burnt or stolen by Ansar Dine, while the rest were conveyed to Bamako, the Malian capital, and preserved. Al Mahdi mobilized residents of the city to attack the shrines with pickaxes and chisels after failing to prevent them from praying at the sites, the BBC said. The ICC stipulated that the Timbuktu structures are "dedicated to religion and constituted historic monuments... and that none of them constituted a military objective." Ansar Dine was expelled from Timbuktu in 2013 by a French-led expeditionary force. The Sufi shrines were rebuilt with help from UNESCO, which had previously designated nine of the 10 that were ruined as World Heritage Sites. Al Mahdi is a former junior civil servant in Mali's educational apparatus. He was trained as a teacher in Timbuktu. The defendant joined Ansar Dine after it captured Timbuktu and sought local followers and functionaries. He is, as noted in passing by the Guardian, an adherent of Wahhabism, the radical interpretation of Islam originating in the Arabian Peninsula during the 18th century. Wahhabism today is the state form of Islam in the kingdom of Saudi Arabia. It is likewise the driving ideology of Ansar Dine, AQIM, the so-called "Islamic State" and similar radical terror networks that identify with Sunni Islam and target Shia and Sufi Muslims for death. But notwithstanding their continuing status under the Saudi monarchy, Wahhabis are considered by many Sunni Muslims to be outside the Sunni tradition. Chief ICC Prosecutor Bensouda warned that the ravaging of cultural and religious heritage by Ansar Dine, ISIS, and other such groups, including attacks on pre-Islamic monuments at Palmyra in Syria, are similar. Yet he failed to trace the thirst for destruction to its source in the Wahhabi ideology. The official Wahhabi clergy in the Saudi state has sanctioned damage to numerous Islamic holy structures within that country's borders, including cemeteries in the holy cities of Mecca and Medina. Wahhabi doctrine holds that preservation of cultural heritage, whether Islamic or non-Islamic, is a form of idol worship or polytheism prohibited in Islam. The Saudi kingdom now faces the need to choose between its continued patronage of the Wahhabi clerics and the danger they pose, inside the Saudi state and abroad, to Muslims, non-Muslims, and global culture, in the form of death and mutilation, cultural desolation, and growing suspicion toward all of Islam. And the world must cease to treat Wahhabi ideology as a footnote to present-day jihadist aggression.